Welsh cakes are something I have been meaning to make for a while, so when I was thumbing through the new book 'Leon: Naturally Fast Food' by Henry Dimbleby & John Vincent, I was please to see a recipe for them. But before the book there was Leon, a chain of fast food restaurants, founded on the twin principles that food can both Taste Good and Do You Good. The first one opened in Carnaby Street back in July 2004 and was named the Best New Restaurant in Great Britain at the Observer Food Monthly Awards. There are now 9 restaurants in and around London, serving over 50,000 people a week! The book 'Leon: Naturally Fast Food' hopes to bring some of their 'food heaven' to us at home, and many of the recipes do just that. Split into two parts, the first section of the book is called Fast Food and contains recipes for dishes that can be conjured up in 20 minutes or less. I was a little confused about this though, because many of the recipes in that section (apart from a few at the beginning) have timings that indicate more than 20 minutes if you include the preparation and the cook times. Having said that, the recipes come with tips, alternative ingredients and interesting little notes, plus there is a key with recipe icons to tell you if the recipe is gluten free or vegetarian for example. The second section is titled Slow Fast Food, and has recipes for dishes that can be prepared in advance and then quickly reheated when you need them. You will also find a bonus feature towards the end of the book, which includes a little from behind the scenes at Leon and some recipes from the Leon managers. 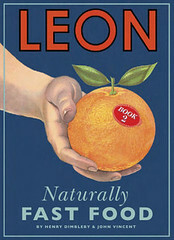 Leon: Naturally Fast Food is not your usual glossy, glamorous cookbook, but it is extremely colourful and lovingly written. Quirky features include a stickers page, hilarious photos and the recipe for 'upside-down apple & cardamom tart' is actually printed upside down - I thought I had a dodgy copy at first! Leon is a book which is meant to be read, thumbed through and explored. It is a book with easy, happy, fun recipes, and there are many ideas on a theme with plenty of variations to the recipes. Other recipes I have bookmarked to try include the mini knickerbocker glory (page 36), Saturday pancakes (page 46), Burmese spicy cabbage (page 54) and Dalston sweet potato curry (page 99). Anyway, back to the Welsh cakes. These are sometimes known as griddle scones and are traditionally cooked on a hot baking stone, I used a cast iron frying pan and that worked perfectly. 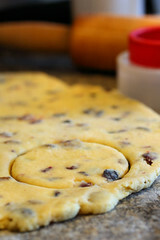 They are flavoured with sultanas, raisins or currants and can include spices such as cinnamon and nutmeg. 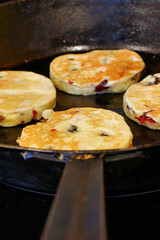 They are circular and may be served hot or cold, with butter or jam. Note: This recipe didn't mention to use any milk along with the egg, I found that the egg alone didn't quite make a dough and I used a large egg, maybe my butter wasn't soft enough. If you have the same problem, I suggest to add some milk a little at a time until the mixture binds together to make a soft dough. Sieve the flour into a large bowl and rub the butter in with your fingertips until it resembles fine breadcrumbs. You can use a food processor for this if you like. Add the sugar and dried fruit and mix well. Beat the egg and add to the bowl mixing well until a dough ball forms. You may need to add a little milk, see above note. Knead for a minute and then roll the dough onto a floured work surface. The dough should be just under 1cm thick. Cut out circular shapes with a 7cm (2¾") biscuit cutter. Heat up a lightly greased non-stick or griddle pan and gently fry the cakes on both sides for 6-8 minutes, being careful not to let them burn. Serve warm with butter, or dredge them in caster sugar. The book can be bought directly from Octopus Books or from Amazon. 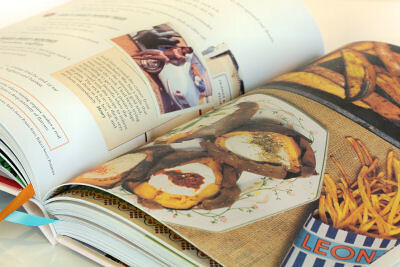 There is also another Leon book called Leon: Ingredients and Recipes. Well here is something I need to try Nic. Love the sultana and raisin cmobo. I'd not heard of 'Leon' restaurants/cookbooks until today and you're the second person to give them a glowing review. Worth investigating, although I'd rather thumb through a Cherrapeno cookbook ;o) ever thought about it? this has sealed the deal that the 'Leon' cookbook is going on the Christmas must have list... lovely cakes! This is so good, will so give it a try! Oh, I'd love to have those Welsh cakes for breakfast this morning ! I always mean to get a copy of a Leon book, I do love eating in there - and so does my son, he is totally in love with their meatballs! Lovely! They look fantastic. this book has surely got to be the book of the month for bloggers, it has been so popular. 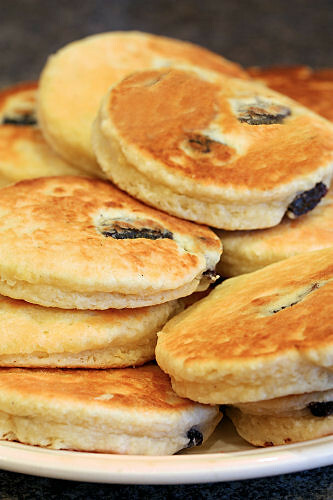 I love Welsh Cakes but for some reason only ever eat them when on holiday in Wales. I have never tried to make them but now I have a good recipe, perhaps I will! Yours look so good. As a Welshcake by birth, I adore eating the real Welsh cake, but they must be warm - melt in your mouth. Just purchased this book, I have to admit I do prefer the first more. PS I agree with Nic of Nip in the Bud, ever thought about a Cherrapeno cookbook?! This does sound like a fun cook book and you've done a good write up about it. Welsh cakes have been on my to do list for a long time, so good to have another nudge.